There are so many ways to make your table look festive for the holidays. 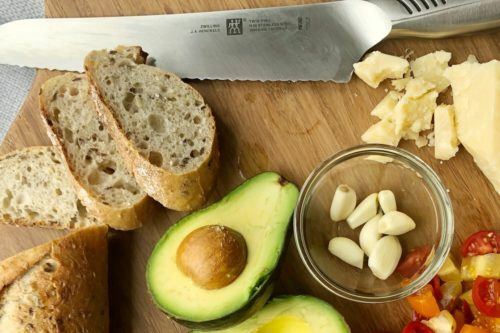 Whether your style is traditional, modern, glitz or glam, Kitchen Stuff Plus has many options to accommodate any theme. 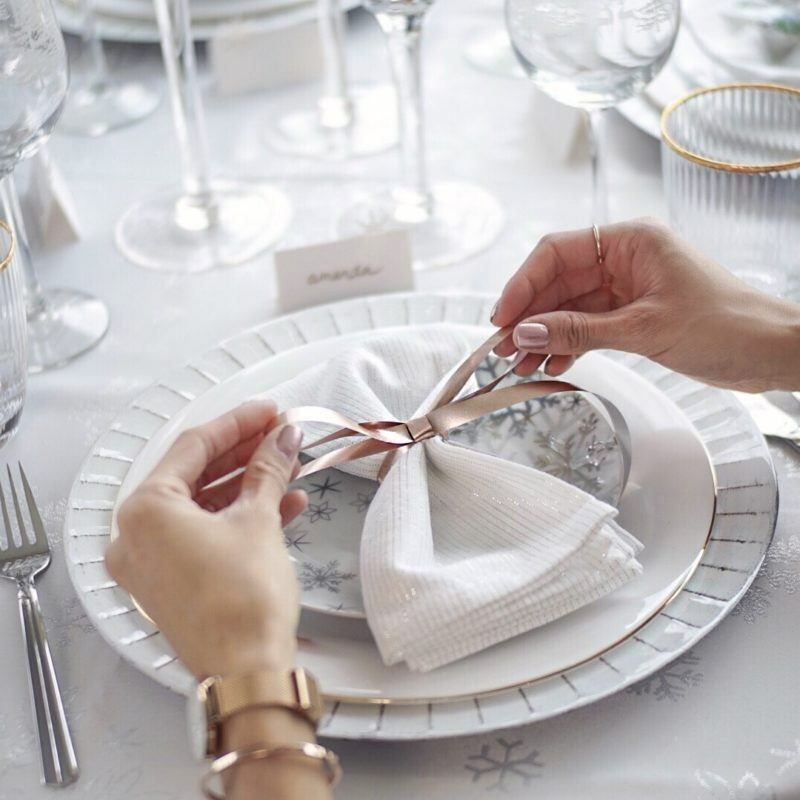 Here are some tips and tricks to help you achieve a festive tablescape that will get your guest into the holiday spirit! 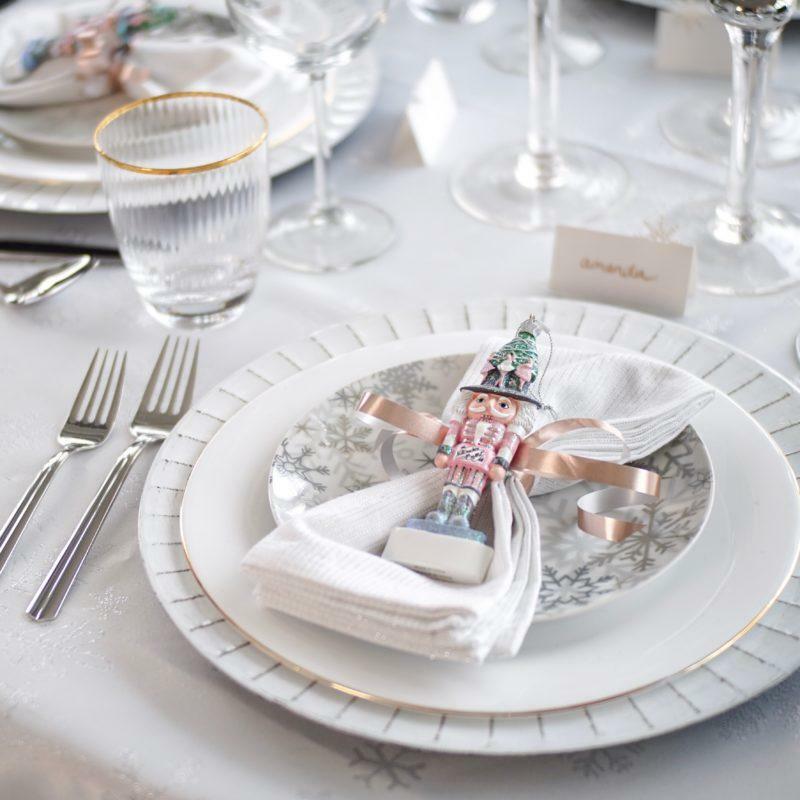 A great way to add some holiday cheer into your dinnerware is by adding festive side plates. Kitchen Stuff Plus has a variety of cute holiday side plate sets to choose from including plaid, confetti, elves, wreaths and even llama ones! I like the subtle snowflake pattern on the ones that I chose. It blends seamlessly with the rest of my winter wonderland theme. Tip: Instead of placing your side-plate on the side like you typically do, place it on top of your dinner plate. If you’re looking for classic dinner plates that can be used for any party, not just Christmas, I suggest these Opal glass dinner plates trimmed in gold. 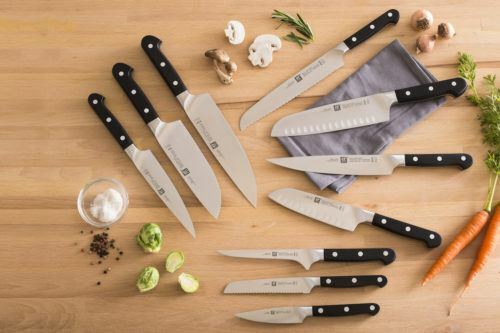 They are so elegant and durable, made from break-resistant opal glass, which is perfect for dinner parties. Charger plates or placemats are essentially there to help prevent spills onto your tablecloth, but they also act as great accent pieces. Choose something that complements your dinner and side plate. What’s a party without wine? 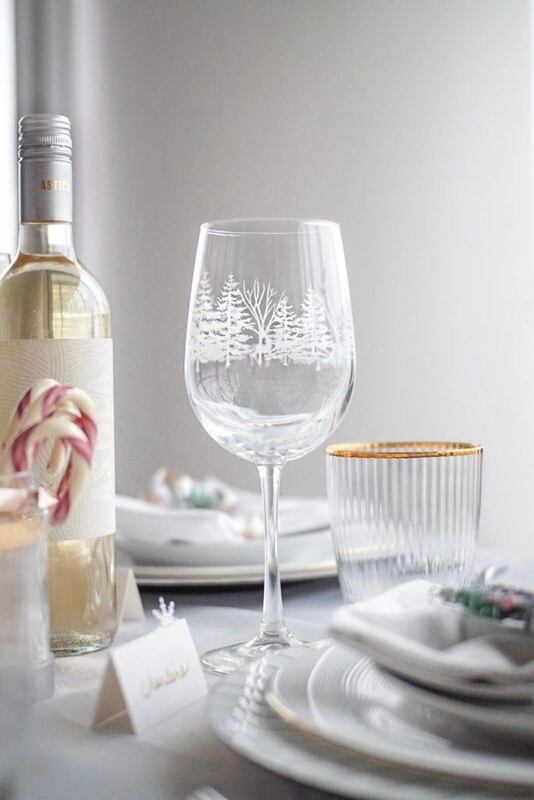 These Libbey Winterland wine glasses are a must for the holiday season! 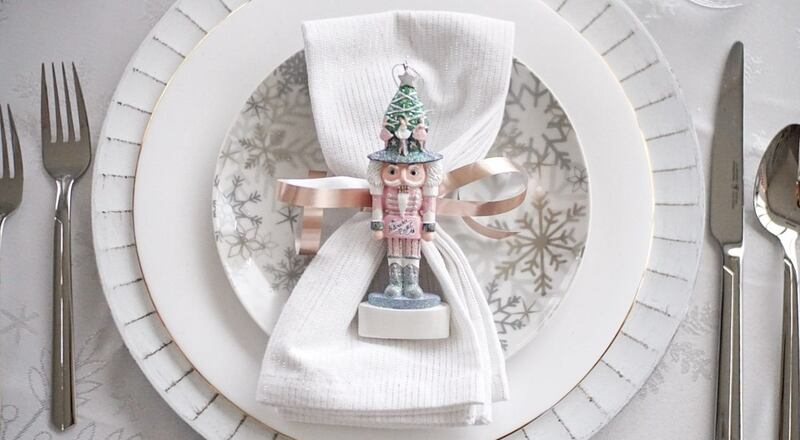 The simple holiday decal adds a classy touch to your table and will pretty much match with any style or theme. What I love the most about them is you don’t have to put them away right after Christmas. You can continue using them all winter long. Keeping in line with the theme, these gold-rimmed glasses are another subtle way to help your table feel cohesive. Lighting plays a huge part in a table setting. 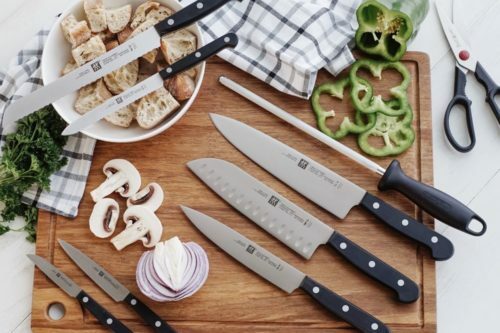 It can really set the tone for your dinner party. These glow glass stem candle holders will not only add mood lighting to your party, but will also act as the perfect centrepiece. They are also available in red. Tip: Burn non-scented candles because you don’t want the scents to interfere with the flavours of your food. Add decor elements that feel like Christmas. It could be ornaments, animals, snowflakes, or greenery, but try to stick with the same colour scheme to make your table more cohesive. I found the cutest little nutcracker ornaments that tied my whole winter wonderland theme together. 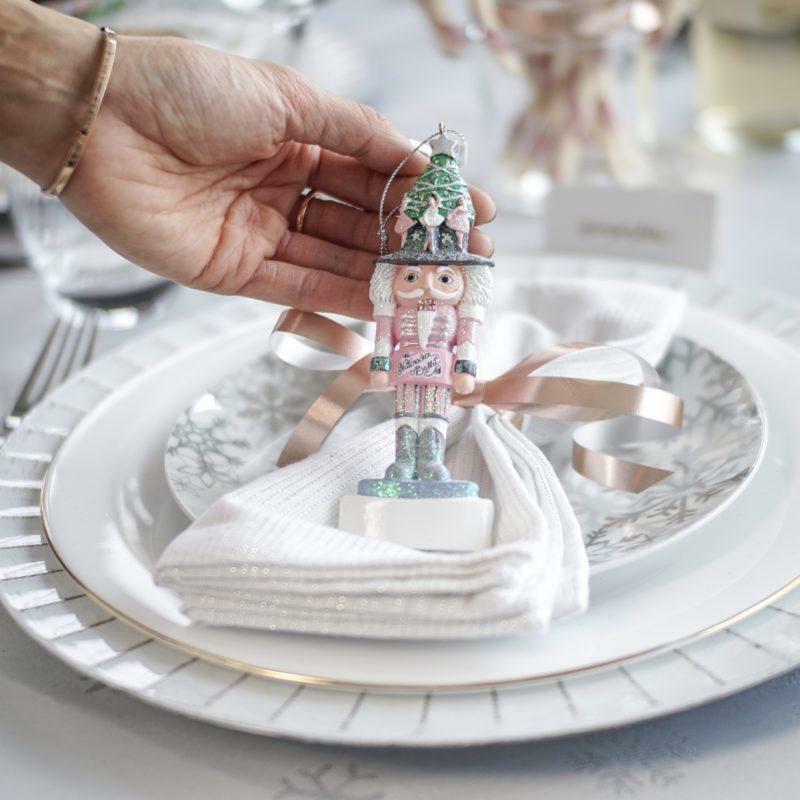 Tip: The ornaments look great placed just on top of the napkins and also will add as a neat party favour for your guest to take home. I love being able to add some kind of personal touch into my decor. Place cards are an easy way to achieve that, and I loved this style with the snowflake pop-out. It will make your guest feel special and for bigger parties, it allows you to seat guest that know each other together to make them feel comfortable. 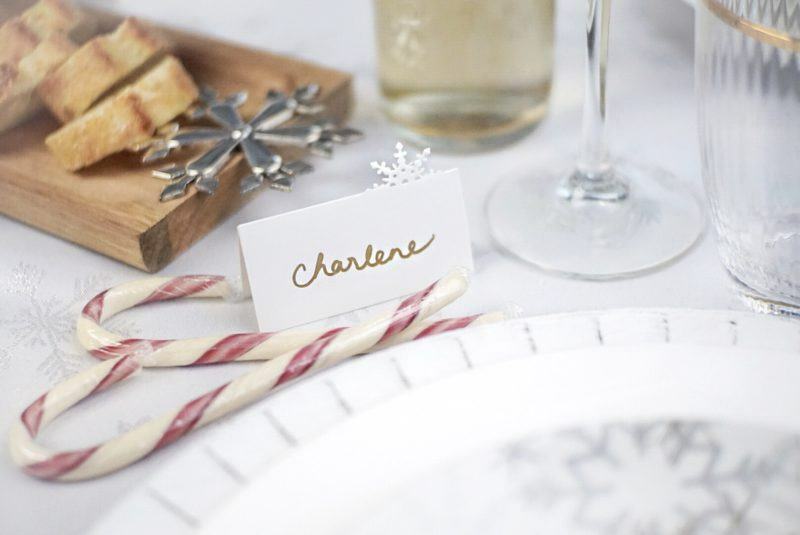 Tip: If you have a smaller party, instead of names on the place cards, you can write a short little Christmas greeting. For a fun crowd, write out a holiday trivia question. 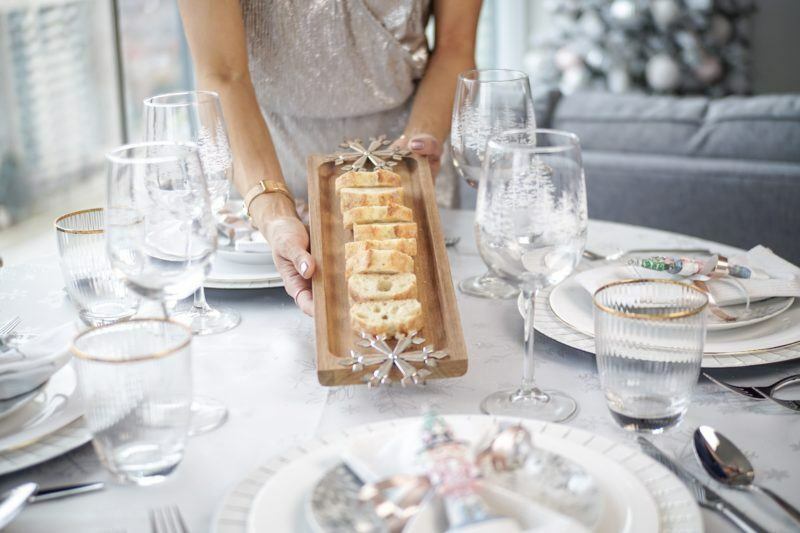 Holiday themed serving ware is another way to add Christmas spirit to your table. I like using holiday themed trays for all my appetizers. It’s the first thing your guest will be diggin’ into, so this will help set the Christmas mood! I picked out this beautiful snowflake acacia tray, which also came with matching snowflake picks. I love the rich wood tone and the contrast of the silver metal snowflakes. This style also is available in a dipping bowl and matching spreader. I hope I’ve inspired you to make your table festive this year. 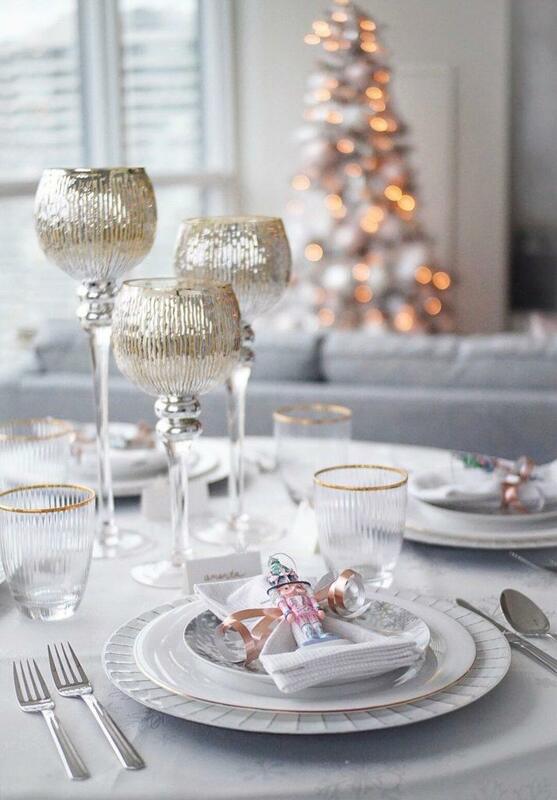 Cheers to a wonderful holiday season and beautifully set tables! Want more Christmas ideas from Charlene? Check out her Under $50 gift guide here or follow her on Instagram @allstylelife.